Author; lived in Russia about the first half of the nineteenth century. Being engaged in business, he devoted his leisure hours to study; applying himself especially to Biblical subjects, and writing much thereon, without, however, publishing any of his work. 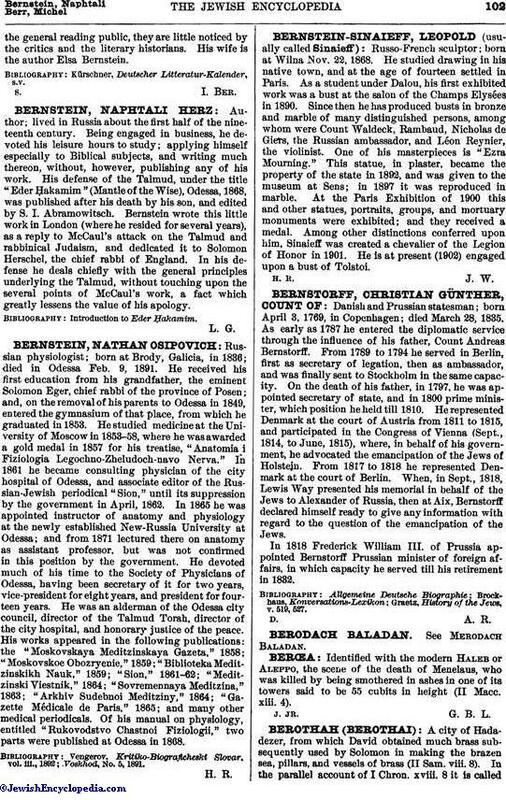 His defense of the Talmud, under the title "Eder Ḥakamim" (Mantle of the Wise), Odessa, 1868, was published after his death by his son, and edited by S. I. Abramowitsch. Bernstein wrote this little work in London (where he resided for several years), as a reply to McCaul's attack on the Talmud and rabbinical Judaism, and dedicated it to Solomon Herschel, the chief rabbi of England. In his defense he deals chiefly with the general principles underlying the Talmud, without touching upon the several points of McCaul's work, a fact which greatly lessens the value of his apology.